I have heard Mark Batterson talk often about how coffee houses are our modern day wells. In Old and New Testament times, wells were a place where people could meet others and talk. It was a place where people went to get refreshed with water for themselves and their animals. While their animals were drinking or they just got off of their feet for a few minutes they would talk with others doing the same. This is how Abraham's servant found a wife for Isaac and how Jacob met his wife. Coffee houses are very similar to these old wells. They are places where sales reps work, students study, employers have interviews, church planters study and people just go to take a break. I always meet folks in these places. I sometimes avoid the local Starbucks when I have a lot of work to get done because I know I will end up in conversations with people. In France, the same is very true. In a culture where people don't talk much to strangers, the coffee house creates a common experience where defenses are down just a bit. We don't plan on going to France and just putting up a sign or sending out an Easter mailer about our cool new church. We know that relationships are key. We know that most people will attend church for the first time because of a relationship. So we will be intentional about developing relationships (I may talk more about that later). Going to coffee shops will not just be a way to to take a break, for our team they will be part of a job description. Want an application? 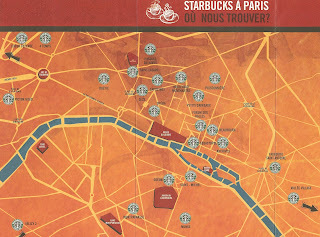 If you love Starbucks, notice the stores in Paris in the picture. But you may quickly forget the mermaid when you sample the local espresso. Ken - Thanks for your post and the parallel between wells and coffee shops. I have often thought about what the common meeting place of this day and age is and a coffee shop is pretty close to that place. Blessings on you, your family and your ministry.